...But I have to admit that this wasn't a completely successful experiment. I don't want to be a party-pooper so let's start with the things I liked about You are Here. 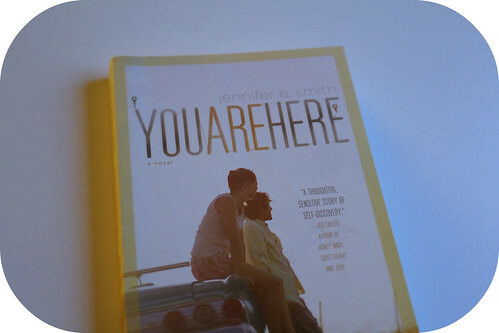 I think that it was a well-written novel, Jennifer E.Smith's writing style is easy and enjoyable and I can really see why this story is easy to like for some people... But I got a bit bored along the way. It's not like I was hoping for a lot of action and excitement. I knew that this story was going to be about humans and human relationships. But to be honest, nothing exciting really happens in this novel and I felt like this book wasn't gripping enough. I didn't connect with the main character Emma. I even thought that she was pretty annoying, and that's usually okay as long as the character goes through some kind of development (but I'm not sure if that ever happens in this case). I was also a bit disappointed with the road-trip aspect of the book, it was fun but I wish it would've been a bigger part of the story. This isn't a bad or horrible novel in anyway. It's a fast and well-written young adult romance for a rainy day but it isn't anything spectacular or special. That being said, there might be a chance that you will enjoy this book more if this genre is the thing you typically go for. I give You are Here 2,5/5 stars.